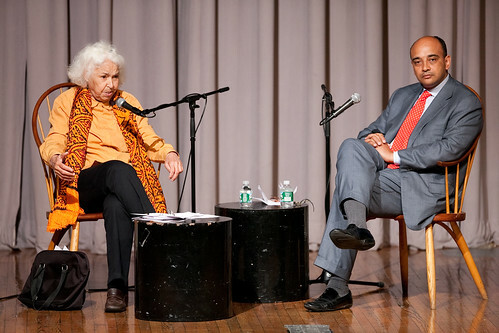 On the last night of this year's PEN festival, the Egyptian writer Nawal El Saadawi appeared at Cooper Union to deliver the fourth annual Arthur Miller Freedom to Write Lecture and to talk with Kwame Anthony Appiah. I didn't find much to disagree with, especially when she spoke against the practice of female circumcision or FGM (a barbaric practice that she suffered herself as a girl, and described in her memoir A Daughter of Isis.) But I was a little put off by her lack of nuance. The applause she received for making big and obvious points — condemning the occupation of Palestine, for instance — seemed, at least in front of this audience, too easily earned. Throughout the evening, El Saadawi spoke far more as an activist than as a writer. The courtly Appiah tried to draw her out about her early reading and beginnings as a writer — almost without result. She read few books as a child, but when vendors sold candy or nuts in paper cones from torn-out pages, she would unroll them and read. Even in college, she learned more from dissecting than from books: that death was a part of life, that there was no separation between the physical and the spiritual. Gods and Soldiers, the new Penguin anthology of African writing, includes a key scene from El Saadawi's best-known novel Woman at Point Zero. In it, a prostitute impulsively stabs her pimp to death, then walks outside and strides proudly down the street — conscience clear, hair and makeup flawless. Could any human being be so calm and unruffled under those conditions (not to mention unspotted with blood)? The scene might provide a satisfying dose of feminist revenge, but it is essentially unbelievable. Perhaps feeling it kinder or more appropriate to address her as a political thinker than a novelist, Appiah avoided asking about her fiction but patiently tried to get her to admit that religion was not always a roadblock to social progress. What about Gandhi? he asked. What about Martin Luther King? What about the pacifism of the Quakers? But she would not be moved. Nawal El Saadawi has had a brave career, inspired many, and done much good. I respect her courage, I honor her work on behalf of human rights, but I regret that in the service of worthy goals she has sometimes used language more as a bludgeon than a scalpel.